Subject: Telangana State Model Schools - Conduct of Admission Test for admission into Model Schools in Class VI and for left over seats in Classes VII to X for the academic year 2018-19 - Conduct of Admission Test through online - Orders issued. Ref: Decision taken by Commissioner & Director of School Education and Ex Officio Project Director, Model Schools, Telangana, Hyderabad. 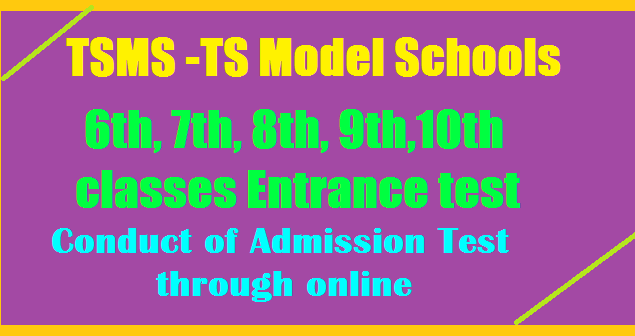 It is decided to conduct online test for Admission into VI Class in TS Model Schools and for left over seats as on date of Admission for classes VII to X for the academic year 2018-19. The date of Examination will be intimated later. Keeping in view the "TS Model Schools online Admission Test", all the DEOs and Ex-Officio District Project Co-ordinators are requested to identify institutions (Examination Centers) having 20 or 30 Computers in all Managements i.e. Govt. Schools, Govt. Jr. Colleges, Engineering Colleges (Govt. / Private), Polytechnic Colleges, Residential Schools, KGBV, Model Schools and Private Schools/Colleges etc. and furnish the list with number of computers available with UPS facilities on or before 11.12.2017 without fail to take further action.in the matter. The matter may be treated as Very Urgent and submit reply without fail.